I'm one of those guys that can own a pair of shoes for years- I take care of my stuff. So when Hickies got in to my radar I wanted to try them out on my different pairs of shoes and hopefully give them an update of sorts. As you can see from the pictures above I tried them with different styles like wingtips, chelsea boots and even Chuck Taylors. They really worked well with all of them. 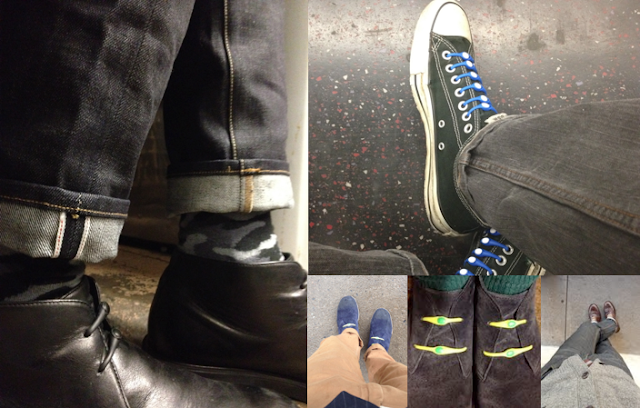 Surprisingly, my favorites were the neon yellow Hickies partnered with the navy suede boots. Coincidentally, those were also the ones that got the most compliments. If you're looking for some cool ways to spice up your (new or old) shoes you have to try these out because you'll end up wearing #HickiesEveryday! Yo soy el tipo de hombre que tiene zapatos por años, yo cuido mis cosas. Cuando supe de Hickies quise probarlos con mis zapatos para ver si quizás los haría sentir como nuevos. Como pueden ver en las fotos los probé con diferentes tipos de zapatos y tenis. Realmente me gusto los resultados con cada uno de los diferentes estilos. Me sorprendí al ver que mis favoritos fueron los de amarillo combinados con las botas azul marino. Por cierto, esos fueron los que mas me alegaron. Si estas buscando una forma de cambiar/mejorar tus zapatos recomiendo que uses Hickies!